MiraDry is the only FDA-cleared treatment that can dramatically reduce underarm sweat in as little as one appointment*. What goes on during the treatment is actually pretty simple. The miraDry procedure is performed in the comfort of the clinic (Park Clinic) and typically takes one hour. 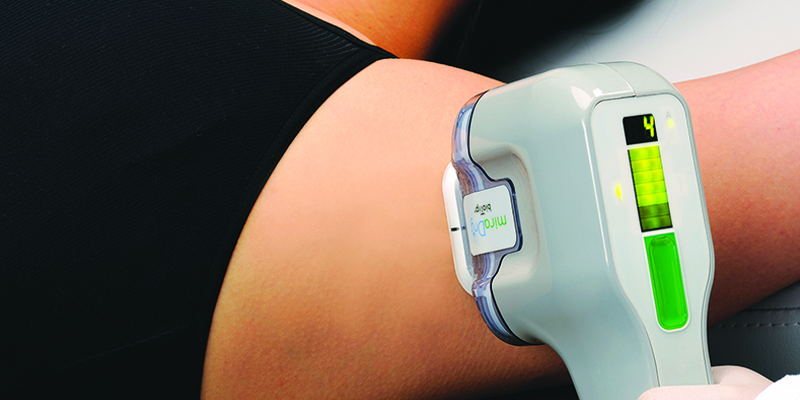 The MiraDry System uses thermal energy that targets and eliminates the sweat and odour glands in your underarm. Once those glands are eliminated, they do not grow back. Goodbye, sweat stains! Step 1 – After your underarm is numbed, the clinician will place the MiraDry device handpiece directly on your skin, lining it up with the temporary tattoo that has been applied to your underarm. Step 2 – Next, the handpiece is activated. You will feel slight suction as your skin and glands are brought closer to the surface for maximum results. Step 3 – Finally, thermal energy is delivered and the sweat and odour glands are eliminated. All the while, the system is cooling to protect your skin and maximize your comfort. Most individuals will see an improvement in the sweating as soon as the treatment is over. Underarm sweat is reduced on average by 82%. Long term studies demonstrate that 100% of patients are no longer bothered by sweat, 89% are no longer bothered by odour and there was a 70% reduction in underarm hair. What are the benefits to Miradry? One of the biggest benefits is the procedure is long lasting. Meaning an individual will not have to have repeat treatments to keep from excessively sweating. The procedure is very safe to do, and is non-invasive, meaning no cuts or incisions. There is no downtime associated with Miradry, as an individual can resume their daily activities after the procedure is completed, and start exercising again within a few days. How safe is Miradry? Is there anyone that should not use this procedure? Miradry is a very safe procedure for adults age 18 and over. It does not penetrate the skin too deep, and the electromagnetic energy is controlled. Only around 2% of sweat glands are located in the underarm region, so the body will still be able to cool itself properly. No known side effects. An individual is a good candidate for Miradry if they experience unwanted underarm sweat or excessive underarm sweating, frequently has to apply antiperspirant, or has stained clothing due to excessive sweating. Miradry is not recommended for individuals that have a pacemaker, who need supplemental oxygen, or have a resistance or intolerance to local anesthesia. Miradry uses anesthesia. Does Miradry hurt? While each individual is different, Miradry has little pain. Many patients give it a pain rating of 2, based on a 1 to 10 rating with 10 being the most pain. There may be some slight pressure on the skin, and it will be slightly pulled. There will also be a warming sensation, with an occasional hot spot that only last for a few seconds. After the treatment, the physician or dermatologist may recommend a pain reliever/ pain medication. Ice packs may also be used to keep the individual comfortable. There may be some localized swelling redness or soreness, which is completely normal and will subside in a few weeks. There may be a short term altered sensation in the layer of skin of the underarms, but this will gradually go away.